My computer is fixed so I am a happy camper again. It is much easier making an entry on this one. I spent a large portion of the week replacing music on my new iPod. The one the thief took was 5 years old and was on its way out. Unfortunately the computer which had all of the CDs copied to it died 4 years ago so I had to copy all of those CDs again to this computer. This kept me occupied as I finished up the pleated jacket. Considering that it is summer vacation time, I reviewed quite a few lessons. I'm glad people aren't letting the heat get in the way of their knitting. I especially enjoy reviewing the Swatch to Sweater lessons. There are so many creative people out there with wonderful ideas. It is very inspirational to me. I enjoy the process of helping them try to make their designs a reality. Purlside decreases aren't part of the Basics Course but they are included in Level 3 of the Masters Program. However, an understanding of these techniques can be useful in projects. When I talk about purlside decreases I mean mean decreases that are made on the purlside when the purlside is the WS of the work. If you are decreasing where reverse stockinette is the RS it really doesn't matter which decrease you use. Decreases made in purl stitches just aren't that noticeable. When would you be making purlside decreases? There are several situations where these techniques are useful. You do see purlside decreases in more complicated lace patterns. Some lace patterns, Traveling Vine comes to mind, use purlside decreases. If you look at a lace pattern and there are a different number of stitches on rows, it is a good sign there will be purlside decreases. Generally in lace, there is a decrease for every yarn over. This keeps the stitch count the same from row to row. This is something you have to be aware of if you find a lace pattern which was written for circular knitting which you want to knit flat. The lace pattern in the round may call for decreases on every row. You then have to translate these to purlside decreases for flat knitting. The vast majority of patterns call for decreases on RS rows. The language used to describe where to place the decreases states "Dec 1 every RS row" or "Dec 1 every other RS row. If the decreases begin on a RS row and the pattern states "Dec 1 every 4th row" or Dec 1 every 6th row", this also means the decreases are placed on RS rows. If a very particular decrease slant is required (say for raglan shaping) you might see "Dec 1 every 3rd row". For the snowboarding hats I just did, I wanted the ear flaps to have a severe slant so I used decreases every row. What do you need to know about purlside decreases? You need to know how they will look on the RS. P2tog is an exact match for K2tog. SSP is a match for SSK. SSP decreases are a bit tricky to make. Like the SSK, you have to slip each stitch and reseat it on the needle. You then purl them through the back. This is a bit tricky. I demonstrate this technique in the video for the week. I also show you how I make them which reduces how much they get stretched out. Decreases are an area of knitting where knitters can get into heated discussions about quality issues. The problem is the SSK. It is really hard to make a SSK to mirror the K2tog. If you look at the decreases above, you can see that the SSP is a neater decrease and a better match to a K2tog. 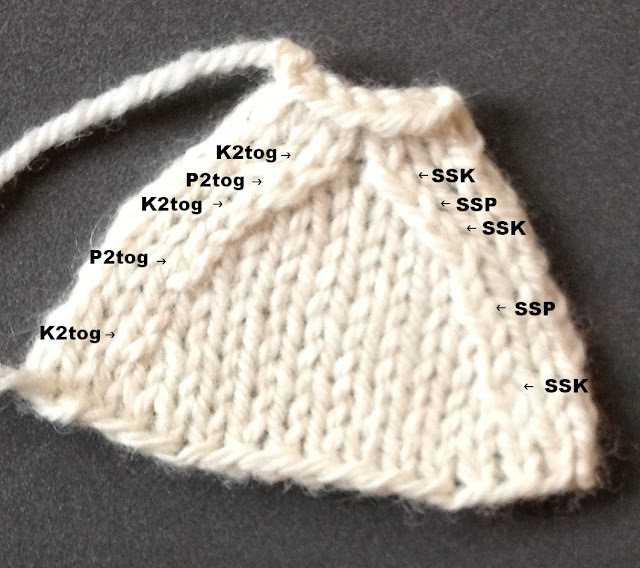 There are knitters who will use K2tog as their right slanting decreases and SSP for their left. This means that the decreases will not be on the same row. The other thing you can do is to make all of your decreases on the purlside. I might consider doing this to shape the v-neck of a white sweater. The photo also shows how decreases look when placed every row. This might be useful for some projects. You can also make twisted decreases. P2tog tbl (purl two together through the back) is a left slanting twisted decrease. It is the same as an SSK where you don't slip the stitches (k2tog tbl?). To make a purlside twisted right slanting decrease, you would slip the two stitches to adjust the stitch mount and then purl them together. Salon will be on Saturday from 2-5pm. I'll be driving up to the airport in Cincinnati on Sunday. I enjoyed seeing every one's projects last week. There was a good turnout. 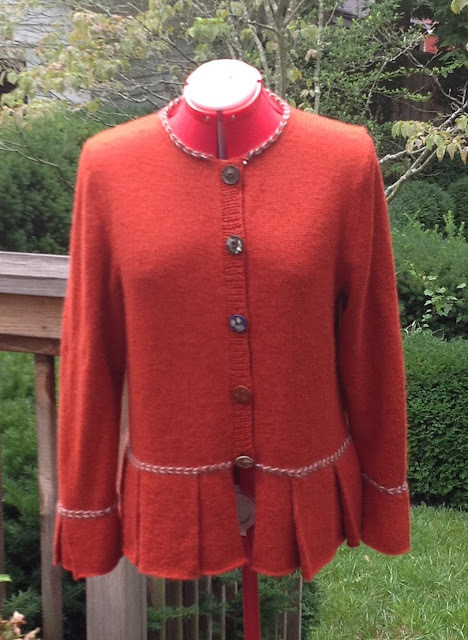 I finished the pleated jacket. It really didn't take that long to knit it. I think it turned out quite nice. The buttons are quite heavy so I am going to put snaps at the top to keep the band in place. The braids are nice but this yarn is so fuzzy it sort of obscures the colors. 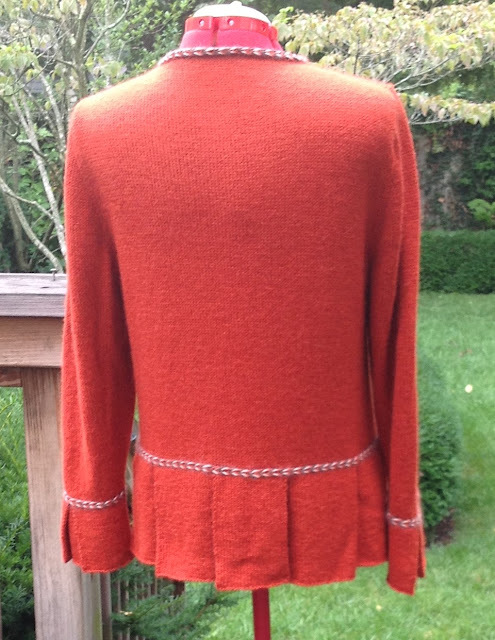 Now I have to do the garment which will accompany the lesson on pleats. We usually do pillows as we want the focus on the stitch pattern but that really doesn't work for pillows. I am doing a baby dress. I spent the better part of yesterday figuring out the sizes. I used the recommended needle size and worked about an inch when I realized that the fabric would be too stiff. I've used Baby Ull a lot but 32 sts for 4" inches just won't work for this dress. I need a much looser drape so I've changed from 2.5mm needles to 3.5 needles. I'm much happy with the feel of the fabric. The gauge now is closer to 26 sts for 4". Now I have to redo all of the sizes. It won't take long to finish the dress. I'm doing the front and back separately. One thing I've noticed is that when I design for babies and kids I get a lot of flak from knitters letting me know what a waste of time it is to do such an elaborate design. I've never really seen it that way. 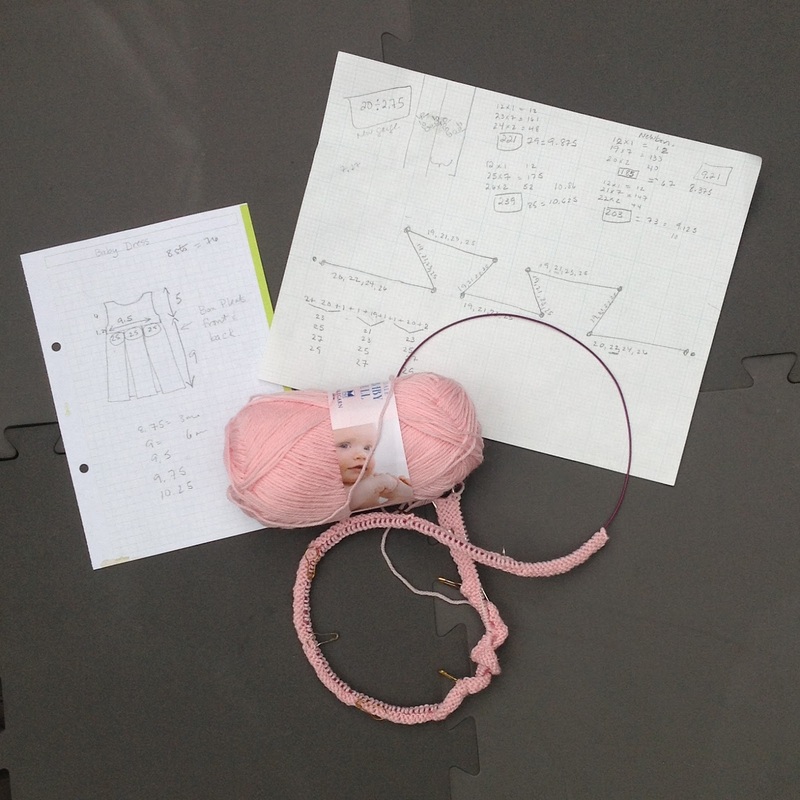 I knit some beautiful things for my children and I now consider them heirlooms. This might fall into that category as well.